Accel has added another pedal effect to it's Classic Series! 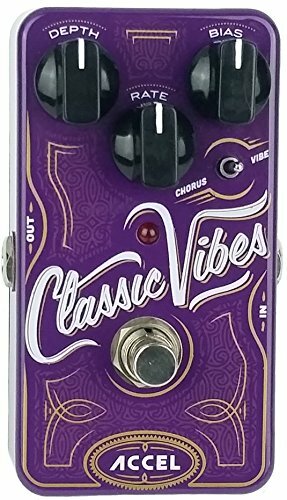 Accel's Classic Vibes is a version of the legendary 60's Uni-Vibe effects pedal. The original Uni Vibe was designed to simulate the deep swirling effects of a rotary speaker. They did such a great job, it spawned a legendary pedal. Accel's Classic Series of pedals are a solute to those early innovators! Designed with four photo cells on the pcb, this pedal successfully captures the lush, warm rotatory speaker effects of the original Uni-Vibe that will make it difficult to put down your guitar. Weight: 11 oz Dimensions: 4.4 in × 2.5 in × 2 in. To view all of Accel's guitar related product available on amazon type in the amazon search bar "Accel Technologies llc". Or for more information on Accel's complete line of product visit accelaudio.com. If you have any questions about this product by ACCEL, contact us by completing and submitting the form below. If you are looking for a specif part number, please include it with your message.